Knocknagoney townland lies on the edge of Belfast Lough, between Belfast and Holywood. Road and rail traffic passes through Knocknagoney constantly, slowing down only for a busy road junction and a Tesco supermarket. But I was looking for the quieter side of the townland, so I went to two parks. First, I checked the map to confirm that Knocknagoney Park was in the right townland. It actually straddles two townlands: Knocknagoney and Ballymaghan. You can begin to see here, as the park rises up the hill, how the townland got its name. Knocknagoney comes from the Irish Cnoc na gCoiníní meaning “hill of the rabbits”. 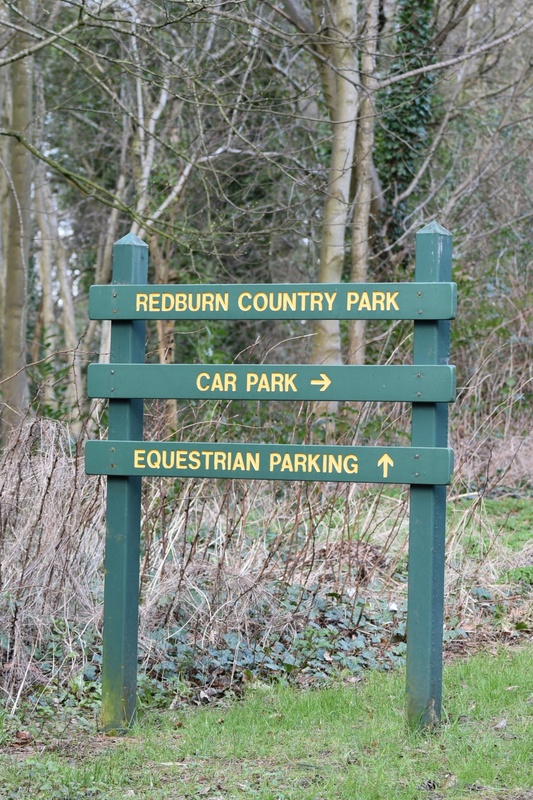 On the Old Holywood Road is the entrance to a second green space: Redburn Country Park. I was hoping that “equestrian parking” would mean a wooden rail for cowboys to tie up their horses, and was disappointed to find an ordinary carpark with extra space for trailers. But the woodland walks were anything but disappointing. From the top of the “hill of the rabbits”, I was able to see right across Belfast. 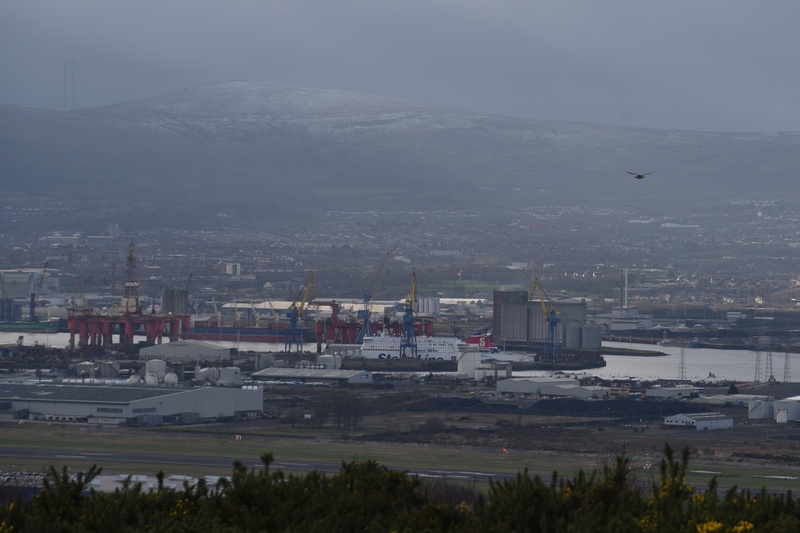 It was freezing – see the dusting of snow on the hill on the far side of the lough in the next photo? I didn’t spot any rabbits on the hill. They must have been hiding from the cold, from the dogs being walked in the park, or maybe even from the hovering kestrel. Here’s another shot of the kestrel. 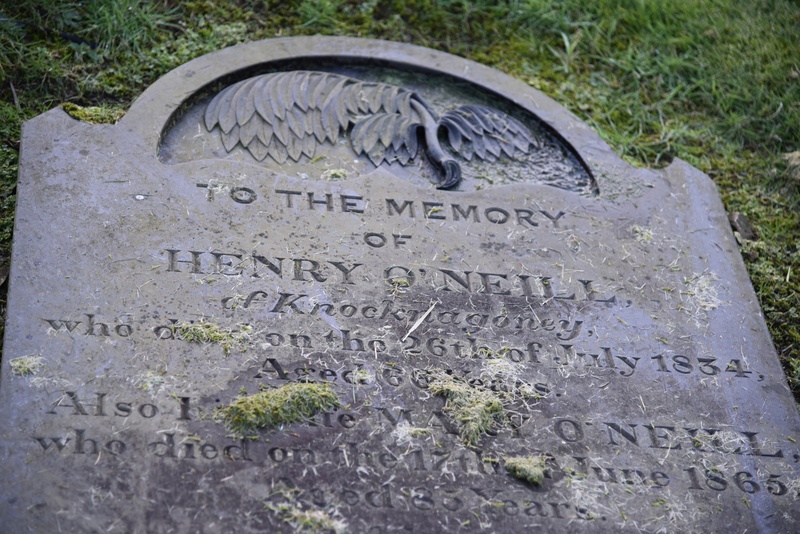 It was getting too cold and dark for me, so I went on (by car, not on horseback) to the next townland of Holywood, where I found two graves for Knocknagoney families. The first one, from 1852, was leaning at a precarious angle. The second one from 1834 was lying flat on the grass. I will go back to Redburn Country Park to see its wildflowers later in the year, and will update this post if I find any bluebells, or even the eponymous rabbits. 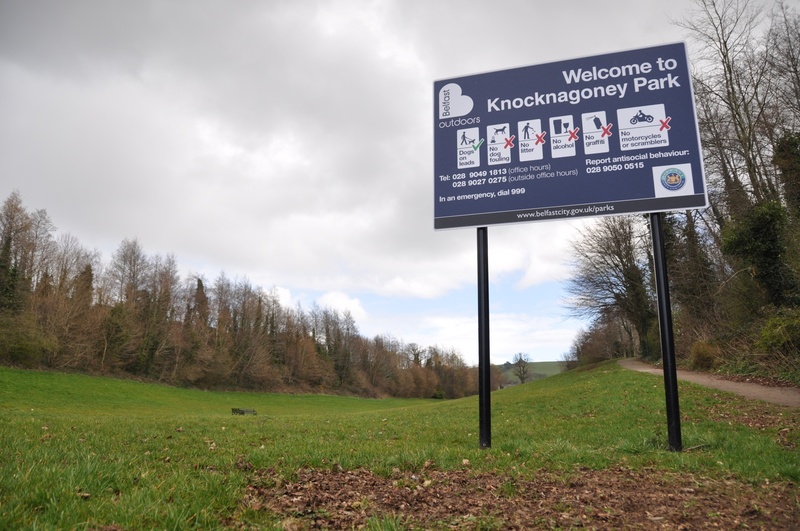 Click here for a map of Knocknagoney on Townlands.IE. 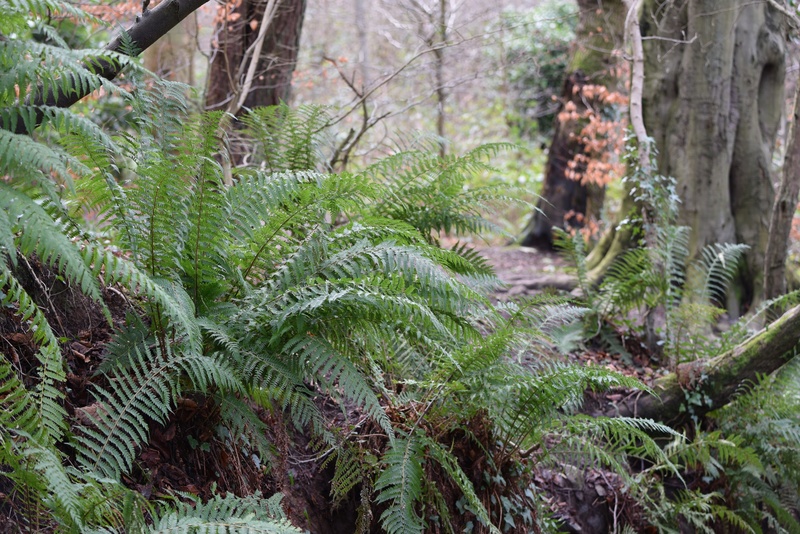 Click here for a link to WalkNI’s information on Redburn Country Park. Which county is Knocknagoney in? County Down. 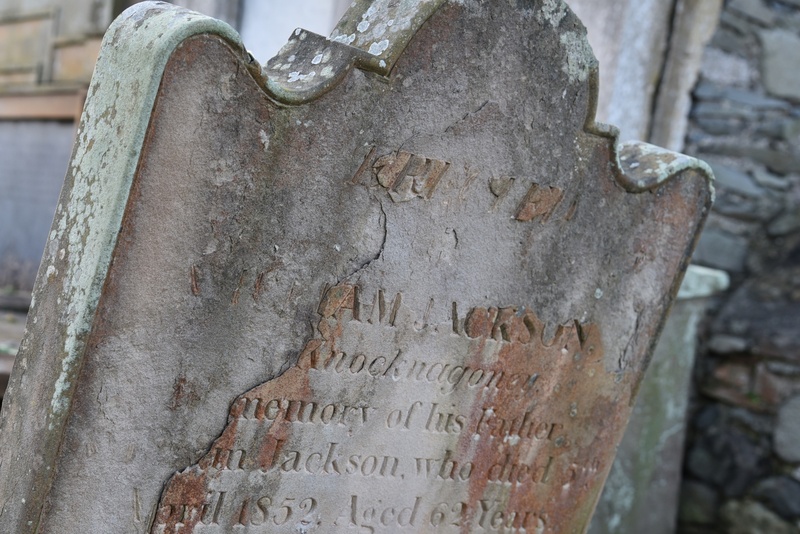 Which civil parish is Knocknagoney in? Holywood. Which townlands border Knocknagoney? To the north, Holywood (with the boundary running along Jackson’s Road). To the south, Ballymaghan (with the boundary running through Knocknagoney Park). To the east, at the top of the hill, the corners of Ballykeel and Ballymiscaw. To the west, Belfast Lough and the reclaimed land of Sydenham Intake. The Irish name interests me because of its similarity to the Ulster-Scots word for a rabbit which is “coney” or “conie”. This has been preserved in the County Down town land of “Coney Island”…..
Good point. I should have mentioned that in the post, but as you say, I will have another chance when I get to Coney Island (or even the townlands called Coneyburrow in Donegal, Kildare and Louth). I don’t think the similarity is mere coincidence. Rabbits are not native to Ireland. By the time the Anglo-Normans brought rabbits here, the animal already had a name like “coney” in many different parts of Europe (conejo, konijn, cuniculus). Here are two links to websites with more information on the etymology. I remember being told in primary school that the name Knocknagoney meant ‘hill of rabbits’. Great views of Belfast from there! Where is this in relation to Cavehill Mountain? 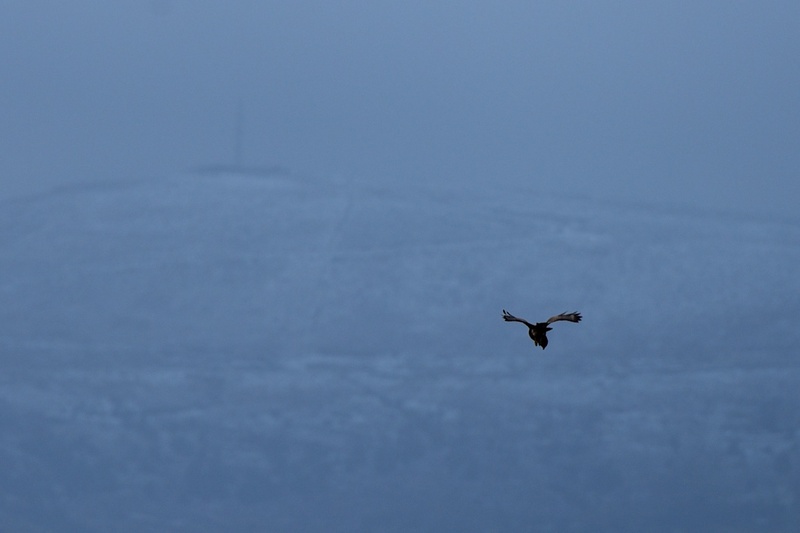 As the kestrel flies, Cavehill is to the right of both of my photos. I must have a photo of it somewhere. Watch this space. Oooh, I will be waiting! That’s a place I would like to visit. I want to see “Napoleon’s Nose” for myself, LOL. 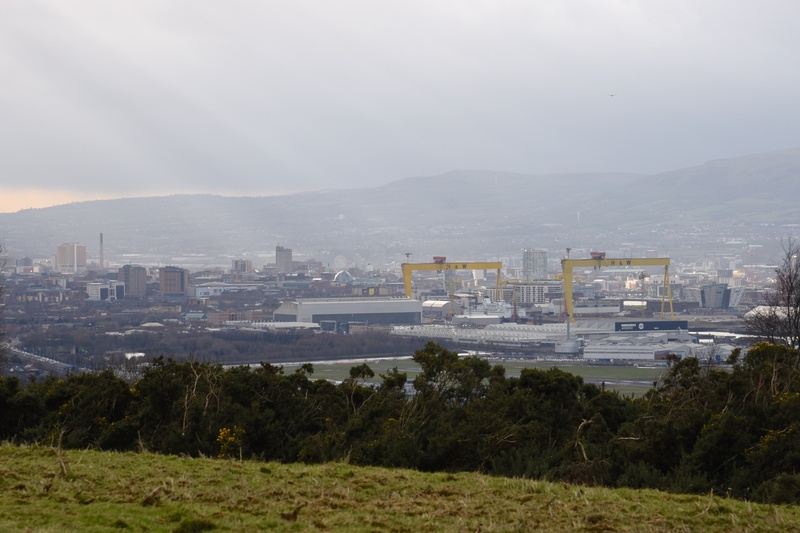 I’ve added another post about the Belfast hills today, but it still doesn’t show Cavehill. So, just for you, I’ve added an extra page. On the front page of my blog, you should see the word “Belfast”, near the top, beside my name. Click on “Belfast” to see a couple of photos of Cavehill. One was taken in Redburn Country Park. The closer view of Napoleon’s Nose was taken from a ship, when I was on the ferry from Belfast to Stranraer in Scotland. Fantastic! I can see the “nose,” all right. Belfast looks small when viewed in the context of the mountain. More like a town than a big city. I think of it as industrial, but there is so much greenery all around. I hope these photos bring back happy memories for you.